Applying iPad Apps in the Classroom: Goal? Language Proficiency! By Nicola Work, Ph.D, Assistant Professor of French, Department of Global Languages and Cultures, University of Dayton. With the growing interest in using iPads for teaching, the inclusion of technology as part of the 21st century skills, and the availability of iPads in classrooms, it becomes more and more important to create language lessons that make effective use of the device. Often teachers and learners alike are overwhelmed by the new technology and the wealth of apps that are available. When searching the Apple Store, for example, several language learning apps focus on grammar, vocabulary drills, and games in a variety of languages. However, it is not the objective of this article to highlight apps for grammar and verb drills. Instead, it is the goal of this article to present a sample of free-of-charge apps that were not necessarily created for language instruction but that can be used in a creative way to encourage critical thinking, enhance language proficiency, and integrate into existing curricula and lessons. WHY USE TECHNOLOGY IN TEACHING? As one of the 21st century skills, the integration of technology into language teaching, curricula, and assessment is imperative. Besides preparing students for the demands of the digital age, there are many other reasons for integrating technology into today’s language classroom. First, using technology is appealing to today’s learner because they are generally comfortable with it. Second, technology can help enhance language learning and differentiate instruction. Since students learn at different rates and have diverse learning styles, technology can help reach all students in various ways. Third, technology can engage students to be active participants in learning and be involved in meaningful, interactive activities. When using mobile technology, for instance, ideally each student has one device, allowing them to actively participate and practice skills targeted in a given activity. Fourth, using technology increases student motivation and creates opportunities to work collaboratively. Collaboration is very easy with iPads thanks to many of today’s apps and readily available Wi-Fi access in most classrooms. Finally, technology can also help relate the curriculum to life outside of the classroom, connect US classrooms to classes abroad, and provide authentic target language and culture examples. In this sense, it makes language study practical and significant because students get a chance to use the foreign language for real purposes. WHY SPECIFICALLY USE IPADS IN TEACHING? This does not mean, however, that simply handing out iPads to language learners is enough to promote learning; careful planning, practice and sequencing is necessary for technology to have a positive impact on language learning. disadvantages of the iPad. Nevertheless, for me and many other educators, iPads are the device of choice because they are portable, cordless, versatile, accessible, and have a long battery life. Lessons that include the iPad are designed to be interactive in nature, actively involving students, encouraging their creativity, critical thinking and problem-solving skills. iPad Apps allow students, for instance, to creatively write their own eBooks or cartoons, to solve problems in simulations or by researching a given topic, to practice language in a variety of contexts, and to receive authentic language input. Individual learning styles and speeds can also be addressed when using iPads. Every student can complete a given activity at their own speed and use a variety of apps to reach a given goal. This does not mean, however, that simply handing out iPads to language learners is enough to promote learning; careful planning, practice and sequencing is necessary for technology to have a positive impact on language learning. HOW DO THE IPAD AND OTHER MOBILE DEVICES FIT INTO THE LANGUAGE CLASS? Just like technology, foreign language teaching has undergone advancements that have drastically changed the way we teach, evolving from earlier rote drills, memorization and grammar-translation approaches to more communicative and proficiency-oriented models. Thus, it is imperative to align new teaching techniques involving technology with current methodologies. Bloom’s Taxonomy was created in 1956 under the leadership of educational psychologist Dr. Benjamin Bloom in order to promote higher forms of thinking in education. Its goal was to encourage skills such as analysis and evaluation instead of merely remembering facts (i.e., rote memorization). The revised pyramid reflects a more active form of thinking and consists from top to bottom of creating, evaluating, analyzing, applying, understanding and remembering. (Anderson et al., 2001). Bloom’s Taxonomy: Original and revised versions. 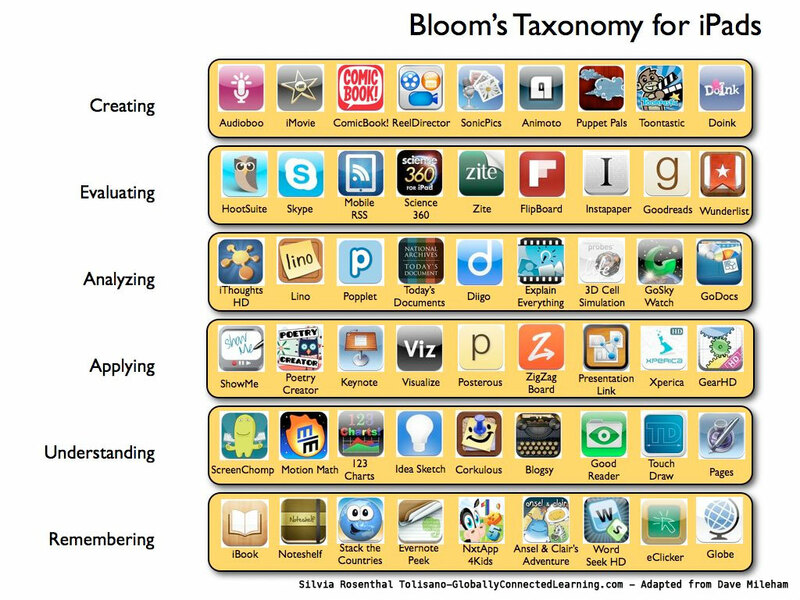 Apple’s App store has a variety of free-of-charge and paid apps that align well with Bloom’s Taxonomy. The diagram below shows a limited selection of possible iPad apps. As educators, we ought to encourage higher order thinking skills in our classes. In a language class, this means moving away from merely memorizing vocabulary, grammar and culture towards applying concepts, analyzing and evaluating language and culture and creating with the language. Concerned about preparing today’s students for tomorrow’s world, the Partnership for 21st Century Skills and the International Society for Technology in Education have drafted frameworks and guidelines outlining what today’s students need to know to meet the challenges of the modern world. In addition to core subjects (such as language arts, math, science and history), these two organizations emphasize the importance of including 21st century interdisciplinary themes (e.g. global awareness, financial, economic, business and entrepreneurial literacy, civic and health literacies) and weaving 21st century skills (e.g. creativity and innovation, communication and collaboration, research and information fluency, critical thinking, problem solving and decision-making) into core subjects. These 21st century skills can be divided into three categories: (1) learning and innovation, (2) digital literacy skills, and (3) career life. The first category encourages (a) the creation of meaningful and authentic assessment and activities that promote higher order thinking skills and (b) the integration of lifelong skills and content into lessons, units, and activities. The second category emphasizes the need to incorporate technology into the classroom. Finally, the third category underlines the need to work effectively and creatively with team members (Partnership). In the graphic below, student outcomes are represented by the arches of the rainbow, and 21st century learning support systems are represented by the pools at the bottom (Partnership). P21 also collaborated with ACTFL to create a custom version of the partnership especially designed for language teachers. Many of the apps available in the Appstore are suitable for language learning and help develop these 21st century skills. It is easy to include several of the 21st century skills in language classes in addition to communication, which lies at the heart of language learning. Using iPads (or any other technology) teaches learners how to access, evaluate, and use information (Information Literacy), how to analyze and create media (Media Literacy), and how to apply technology (ICT Literacy). Many apps available in the App Store allow collaboration among learners and encourage critical thinking and creativity. Finally, networking with other learners and native speakers allows for cultural language exchanges in the target language and is facilitated by the myriad of social media apps available (Global Literacy and Network Literacy). In 1996, a task force representing a variety of languages, levels of instruction, program models, and geographic regions created the “Standards for Foreign Language Learning: Preparing for the 21st Century,” in an attempt to define content standards, namely what students should know and be able to do in the target language. This document “represents an unprecedented consensus among educators, business leaders, government and community on the definition and role of foreign language instruction in American education.” (ACTFL, 2014). The Standards are comprised of the following categories, often called The Five C’s: Communication, Cultures, Connections, Comparisons and Communities. First, students should be able to communicate in languages other than English and use language for communication in real-life situations (Communications). Second, students should gain knowledge and understanding of other cultures and, hence, be able to understand other people’s points of view, ways of life, and contributions to the world (Cultures). Third, language instruction should be connected with other disciplines (Connections). Fourth, students should be able to discover patterns, make predictions, and analyze similarities and differences across languages and cultures and, in turn, come to understand their native culture better (Comparisons). Finally, students should participate in multilingual communities at home and around the world, thus extending the language class beyond the classroom (Communities) (ACTFL). And since, according to the task force that created this document, language and communication are at the heart of the human experience, the Communications category is divided into three distinct modes of communication: (1) interpretive mode, (2) interpersonal mode, and (3) presentational mode. In the interpersonal mode, students engage in conversation, provide and obtain information, express feelings and emotions and exchange information. This mode encompasses either the skills reading/writing or the skills speaking/listening. As part of the interpretive mode, students understand and interpret written or spoken language on a variety of topics. For the presentational mode, students present information, concepts and ideas to listeners and readers on a variety of topics. This involves speaking and writing in the foreign language (ACTFL, 2014). These modes should be incorporated into all foreign language classes in order to assure that learners are linguistically and culturally equipped to communicate successfully. A variety of iPad apps can help target the different modes of communication. Proficiency-oriented language teaching, a product of educators and linguists who had grown dissatisfied with audio-lingual and grammar-translation methods, represents a general framework for organizing instruction, curriculum, and assessment rather than a method or theory. At the heart of it lies the importance of being able to communicate in the foreign language in real-life situations. Thus, in a proficiency-oriented classroom, students learn a language in context and try to apply their knowledge in real-life situations. New vocabulary and constructions are presented in context and their cultural connotations are highlighted. Authentic language input plays an important role in the proficiency-oriented classroom. From early on, the target language is used and students are encouraged to express meaning in personalized communicative activities. The classroom is student-centered and emphasizes partner and group work. The instructor, in a role of mediator, circulates the room and gives individual feedback and help. Grammar still plays a role in the proficiency-oriented classroom but is often introduced inductively to encourage critical thinking and address different learning styles. Language use in the proficiency-oriented class should be personalized, creative, communicative, for a purpose and mimic real-life situations (Omaggio Hadley, 2001). Many iPad apps fit perfectly into a proficiency-oriented classroom because they encourage target language use for a purpose and in a creative and personalized way. Note that the use of iPads and apps should never be simply for the sake of using technology, but to fulfill specific goals for enhancing student learning, to achieve overall class and learning objectives, and to increase student motivation and involvement in the learning process. higher order thinking skills (Bloom’s Taxonomy), 21st century skills and associated literacies, the Five C’s and different modes of communication (National Standards) and creative, personalized language use for a real purpose (proficiency-oriented teaching). For each app, I present (1) a short description of its capabilities, (2) a table outlining the various skills, suggested proficiency level and suitable topics, and (3) explicit teaching ideas and topics. These teaching ideas are suitable for and adaptable to various proficiency levels, valid for most languages as well as appropriate for learners of different age groups. Note that the use of iPads and apps should never be simply for the sake of using technology, but to fulfill specific goals for enhancing student learning, to achieve overall class and learning objectives, and to increase student motivation and involvement in the learning process. Comics Head Lite by NextWave Multimedia Inc is a free app that enables students to tell stories and share experiences in a visually compelling format – comics and photo journals. Students pick a panel template, background (indoor or outdoor), character (type, male/female, action), and speech bubbles for each square of their comic strip. The text is typed in each speech bubble. A variety of fonts and text sizes are available and stduents can use the international iPad keyboards to input characters and diacritics from various languages. The possibilities are endless; everything is movable on the screen, customizable in terms of size and color, and students can add as many characters as they like. Students can save their work as an image, or an editable file on their iPad and can share it via email or social media. Table 1. Comics Head Lite app and its compatibility with teaching frameworks. Comics Head Lite is suitable for a variety of proficiency levels and can be used with learners from early on. Novice learners can practice greetings in the foreign language (see Figure 7), asking how people are doing and introducing themselves to others by creating comic dialogs. At the intermediate level, students can produce dialogs such as question and answer sessions or interviews about the weather, likes and dislikes, or food. These dialogs could encompass ordering food in a restaurant or solving problems such as giving directions or planning an event. At the intermediate-high level these stories could entail events in the past or in the future, a debate, or a trip. As an extension after the creation of the comic strips, students could be asked to read some of their classmates’ comics and re-enact them in class and the class could pick the winning comic strip. Comics Head screenshot and example of French greetings cartoon. Our Story by The Open University was originally developed by child specialists at The Open University to enable young children to take part in fun games to help them hone the skills necessary to learn how to read. However, this is an excellent storytelling and book-creating app that can be used in a variety of ways in the language classroom. First, students take a series of pictures with the iPad camera for the story. From within the app, students select all the pictures they would like to use and drag them onto a timeline in whatever order they see fit. Then, by selecting each picture, students can enter text by typing on the keyboard or by recording a narration with the built-in microphone. Finally, they can select a title for their book and save the project. It can be exported as a PDF file in a variety of sizes already including page numbers, so students can fold the print-out version and create a physical book. If students recorded a narration, this project is exported – also via email – as a slide-show. Table 2. Our Story app and its compatibility with teaching frameworks. Our Story can be used at any level to creatively write in the foreign language. Beginning learners can write a short description of themselves and/or their university life supported by pictures they take. This app would also be a great asset for writing about a daily routine where students practice the reflexive verbs and illustrate their story with pictures they take. Students could also present their family and write a story about them; each photo of a family member and pet and their hometown can be supported by a caption in the target language to practice physical descriptions, as well as likes and dislikes. A portrait of a person (e.g., a best friend) would also be a great topic to use with Our Story. At the intermediate level, the Our Story app could be used to narrate an event in the past or in the future (e.g. a trip, a party, or any other event) with the help of pictures. Finally, Our Story would be great to present cultural information about a famous person in history, a film, a book, an author or musician, a dish, or a festival. Learners would research some of the information, include pictures (from books, or the web, or their own) and create a short story book describing their cultural topic. As an extension, these books would be excellent for other students to read, thus practicing their reading comprehension skills. Photocard by Bill Atkinson by Bill Atkinson Photography is a free postcard app that allows users to create unique custom-designed postcards using one’s own photos or Bill’s expressive nature photos, and send them as eCards. After selecting the image for the card, students can type a message on the back in a variety of fonts and languages, address the card, and add decorative stamps and stickers. There are hundreds of stickers and stamps to choose from themes such as smileys, travel, food, sports, animals, holidays, and many more. The individualized postcard can then be sent as an eCard via email. Table 3. Photocard app and its compatibility with teaching frameworks. With this postcard writing app, students can learn the target culture’s conventions of formatting while creatively using the target language. At the beginning level, students can write a very short postcard introducing themselves or their family. At the intermediate levels, students can write about a past vacation, a virtual visit of a country, a country, famous person, or about a certain custom. Students could send these postcards to the whole class, to one classmate, to pen pals within the same school, within the US, or abroad, and copy the teacher. Intermediate-level students can have a real exchange with native-speaking students sharing holiday customs and other cultural information. Finally, a nice gesture would be to send every student a short postcard on their birthday. PicView by HOP SA is a free app that allows students to voice annotate pictures. The pictures can be taken or imported from camera roll. Once a picture is selected, students can give a title, select a frame, and apply filters to creatively modify the picture. Then, a voice recording will be added to the picture. After creation, the final product can be published to PicView, Facebook, Twitter, or can be emailed. Table 4. PicView app and its compatibility with teaching frameworks. PicView is suitable for all levels of proficiency and is adaptable to many topics. At the lower proficiency levels, students can take a picture of themselves and record an auto-portrait stating their name, their age, information about their family, what they study, and what they like to do. With pictures of people (e.g., classmates, family members, or themselves), physical descriptions (e.g., hair color, eye color, height) or clothing and colors can be targeted. Topics for intermediate students could be describing their room, their house, a movie poster, a famous painting, or a menu. The choices are endless. Teachers can also provide students with the same picture (students then take a picture of it to import into the app) and have students describe the given picture. This is a nice way of assessing their level of proficiency and might be done as a means of evaluation. Cultural comparisons could also be done via PicView by providing students with a picture of cultural importance (e.g., food, clothing, streets with cars). Consequently, they can tell what they see in the picture and what cultural differences they notice. Finally, as an extension and to practice their listening skills, students can be asked to listen to two or three other projects and either write a small composition about them or present to the class what they heard (depending on their proficiency level). Project “my cat” with recording. Tellagami by Tellagami Labs Inc. allows users to create and share quick animated messages called gamis. This app is suitable for a variety of topics and is adaptable to various proficiency levels. It is very easy and intuitive to use; students create their avatar and customize it by selecting hair color and style, eye color, skin tone, outfit, shoes, and emotion. An existing background can be chosen or a picture imported. The avatar can be resized, moved freely on the background, and finally be rotated. At the end, students have the option to give the avatar a voice by recording a message. The final product, a so-called gami, can be saved to the camera roll, shared online, or sent via email. Table 5. Tellagami app and its compatibility with teaching frameworks. Its application in the language classroom is varied. For lower-level proficiencies or at the beginning of a school year or semester, students can introduce themselves talking about their age, personality, physical traits, their likes and dislikes, and the classes they take. They can also describe their family or a family member, or one of their classmates in detail (after an in-class question and answer session, for example). At the intermediate level, learners can pretend they are a famous person or a historical figure and present themselves from their perspectives. This can be done without mentioning their person’s name, and the other students, as an extension, can listen to them and guess. Also, learners can talk about what they did last weekend, last summer, or during holidays to practice narrating in the past, or about their plans for next weekend, summer, or vacation to practice narrating in the future. With Wordsalad by Libero Spagnolini students can create word clouds on the iPad. In order to import text into the app, another application such as Pages, Notes, etc. has to be used. Once the text is typed, students select and copy it, and insert it into the Wordsalad app. Students have the possibility to change the font, layout, and color of the word cloud before saving it either in camera roll directly on the iPad or saving it as a PDF file and exporting it via email. Topics Auto-portraits, descriptions, culture keywords, vocabulary lists, reading summary, composition. This tool is suitable for all levels but appeals especially to beginning levels. From very early on, learners can use simple nouns and adjectives to describe themselves using word clouds even before they can produce complete sentences. Learners can use and produce words from the very first chapter to introduce themselves to the teacher or each other: student, blond, tall, intelligent, tennis, movies, etc. This app can also be useful when learning and/or working with new vocabulary. Learners can either prepare lexical fields (i.e., words associated with a concept, word or expression) or prepare a personal word list (using only the vocabulary they are likely to use because it applies to them or is of interest to them) linked to the chapter vocabulary. Cultural content can also be presented this way; learners read about a certain cultural topic and put the most important words/concepts into a word cloud. To take this even further, this could be used as the basis for a short in-class presentation with the word cloud serving as the notecards to encourage spontaneous speech. At the intermediate or advanced levels, word clouds can be used to summarize a reading, brainstorm for a project, or outline a narration, argumentation or other type of essay. It is crucial to understand that technology in general, and iPads and apps more specifically, should not merely be used for technology’s sake; rather, they need to support the course or lesson objectives. Any work done with the iPad (or any other technological device) should be carefully integrated into existing lessons and curricula, should fulfill a clear pedagogical objective, and should encourage students to use the foreign language for a real purpose. When using apps in the classroom, goals for their use should be explained to the students. As with all technology, there is a learning curve for both learners and teachers that needs to be taken into consideration. To that end, teachers need to test and evaluate apps for appropriateness in terms of content and student age. Especially some of the free-of-charge apps might be unsuitable for a younger audience due to their content, language, or advertisements. Teachers should also be familiar with how to use the app and its features in order to be able to explain it to their students. A good way of introducing a new app to the class is providing an example of how to use it and what a final product would look like. Students should also receive a document either in printed or e-format with rules for appropriate iPad and app usage and a list of responsibilities. Finally (and this is true for the use of all technology in the classroom) teachers need to be patient as there might always be difficulties with apps, iPads or Wi-Fi connections, and have a plan B ready if everything else fails. One of the most important goals in foreign language education is to encourage our students to learn to use language for real-life communication. Utilizing apps and iPads in and outside of the classroom can serve a variety of objectives: use language for a real purpose (three modes of communication); practice a variety of skills (listening, speaking, reading, writing); get learners ready for the 21st century; foster creativity and individuality; encourage higher-level problem-solving and critical thinking skills. To this end, a selection of free-of-charge apps that were not specifically designed for language teaching but ones that could be creatively used and adapted to fulfill several of the above-mentioned objectives were showcased in the hope that they will find their way into language classrooms of all different levels. Anderson, Lorin W., David R. Krathwohl, Peter W. Airasian, Kathleen A. Cruikshank, Richard E. Mayer, Paul R. Pintrich, James Raths, and Merlin C. Wittrock. A Taxonomy for Learning, Teaching, and Assessing: A Revision of Bloom’s Taxonomy of Educational Objectives. Complete ed. New York: Longman, 2001. Bloom, Benjamin S. Taxonomy of Educational Objectives, Handbook I: The Cognitive Domain. New York: David McKay Co, 1956. “Compare IPad Models.” Apple. Accessed June 15, 2014. http://www.apple.com/ipad/compare/. Leonard, Devin. “The IPad Goes to School.” Bloomberg Business Week. October 24, 2013. Accessed June 14, 2014. http://www.businessweek.com/articles/2013-10-24/the-ipad-goes-to-school-the-rise-of-educational-tablets. “National Standards for Foreign Language Education.” ACTFL. Accessed June 15, 2014. https://www.actfl.org/advocacy/discover-languages/advocacy/discover-languages/advocacy/discover-languages/resources-1?pageid=3392. Omaggio Hadley, Alice. Teaching Language in Context. 3rd ed. Boston: Heinle & Heinle, 2001. “Partnership for 21st Century Skills.” P21. Accessed June 15, 2014. http://www.p21.org/index.php. Tomkins, B. “WWDC 2013: IOS App Store Now Home to 900,000 Apps, 375,000 IPad Specific.” 1 Place 4 Apple. January 1, 2013. Accessed June 1, 2014. http://1place4apple.com/2013/06/wwdc-2013-ios-app-store-now-home-to-900000-apps-375000-ipad-specific/.